Leporello pattern fold-out with 8 handpainted leaves of Art Deco style designs in multicolor. Includes a stunning Christmas tree with flower garland. Corners, borders, and ends, well suited for table runners and curtains. Motifs are mostly geometric, but page has three borders, one with squirrel, one with a fish, and one with a bird. Reverse side is blank. Some designs were also in Annemarie Van der Peuts collection. Original plus modern recharting and DMC color key. 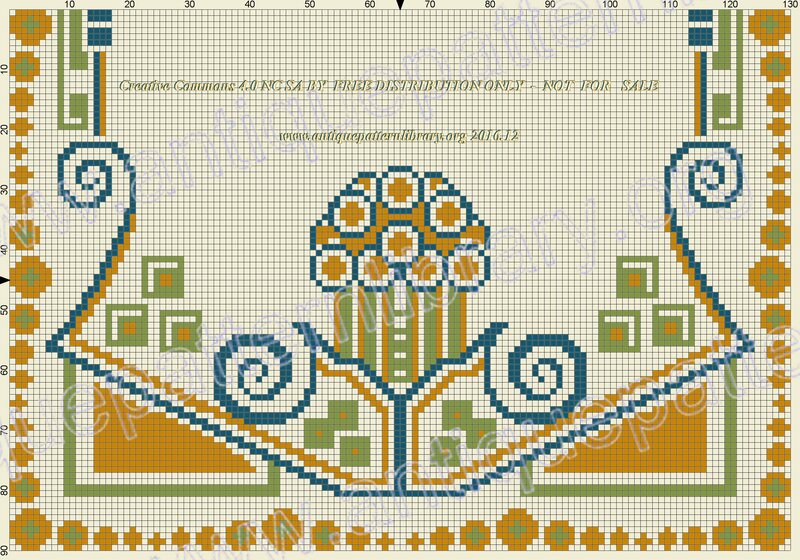 Best suited for cross-stitch, although some of the designs can be adapted for needlepoint or Berlin woolwork. Scans donated by Jackie Isler, from the collection of her grandmother. Charted by Franciska Ruessink.